Seeking Gifts to support scholar athletes to play lacrosse and off set a portion of tuition costs for select recipients each spring semester. Private support of the Alex Kiehl Scholarship Fund both honors "teamwork and effort" for which Alex inspired us and is an enduring core value of the team and provides financial tuition relief to selected student athletes on a four year basis. Our plan, completed in 2010, to build a sustaining championship level program is dependent on attracting dedicated student athletes with a strong belief in the value of unselfish team work. We believe that having a select portion of the team recieving small "tuition offset" scholarships, based on need, in spring semester, is a powerful incentive to award high achievers and grow the core values of our program. We seek to make the Alex Kiehl scholarship fund accessible each season for special players who fit the example Alex has set. (1) Checks may be made payable to the Georgia Tech Foundation - Alex Kiehl Lacrosse Scholarship Fund and mailed to them at Georgia Tech Foundation, Inc., 760 Spring Street, NW, Suite 400, Atlanta, GA 30308. (3) An electronic transfer of Stock to the Georgia Tech Foundation can be made by contacting the Foundation. Stock held in certificate form can be transferred by mailing the certificate and the stock power in separate envelopes to the Foundation. For more information contact the Foundation at 404-894-6130. For further information concerning making a gift, contact Emily Takieddine, Director of Development for Student Affairs, at emily.takieddine@dev.gatech.edu or 404-385-0527. 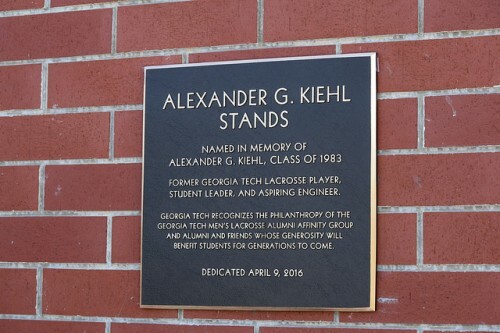 In the fall of 1978, Alexander George Kiehl, (Alex), entered Georgia Tech as a freshman Co-Op Chemical Engineering major and made an impact that resonates strongly to this day. Alex attended high school at Norfolk Academy in Norfolk, Virginia. One of five children (all sons), he was the fourth son of Elmer and Aroostine (Dar) Kiehl of Virginia Beach. Alex excelled academically and wanted very much to be a Tech Engineer. At Norfolk Academy he lettered in three sports and excelled especially in lacrosse. Alex loved the beach and was an accomplished sailor of his own Hobie Catamaran. Upon his arrival at Georgia Tech, he pledged Pi Kappa Alpha Fraternity and joined the Georgia Tech Lacrosse Club along with an unusually talented group of freshmen and transfer students. The new group of players strongly desired to create an environment closer to a varsity team rather than that of a club team. The coaches structured a strong fall program and set up an upgraded schedule including several varsity opponents for the spring. Alex’s athletic ability at the midfield position was immediately evident as was his strong leadership skills. At the conclusion of the fall program, it was obvious that the team had strong potential on offense but had some weaknesses on defense. The coaches also learned that Alex had played defense in high school and was very accomplished at that position. Alex was asked to move to defense for the good of the team. He was visibly upset. Alex explained that in high school he was asked to do the very same thing and in college he really hoped to play more on offense. The coaches explained that they were trying to build a competitive program and his teammates needed him on defense. Alex immediately put aside his own personal desires and committed to what was best for the team. The 1979 team went on to have a transformational season, and Alex was a key contributor to that success. He exhibited great leadership, positive optimism, strong teamwork, respect for the sport, and outstanding sportsmanship. At the end of the spring season, Alex was named the “Most Valuable Player – Defense” for the team. Off the field, he was very successful in the classroom and was elected president of his fraternity. A stronger role model would be difficult to find. He was one of the most popular and respected players on the team. Alex’s life was tragically taken from him just before the school year ended. Alex was simply in the wrong place at the wrong time. Inspired by Alex’s memory, his teammates over the next three years played in his honor and created a highly successful team based on unrelenting effort and teamwork. A banner with his jersey number was tied to the goal netting at every game by his teammates to signify that Alex was still with them as a part of the team. For more than twenty years the lacrosse team has given an award in Alex’s name to an outstanding freshman player who exhibited Alex’s love of lacrosse, his love for his teammates, and unselfish team play. 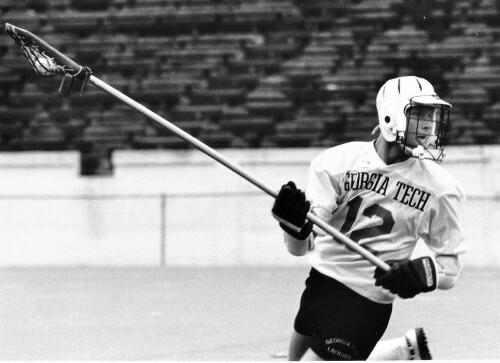 Georgia Tech Lacrosse alumni also fund a scholarship in Alex’s name of which there have been over twenty-five recipients.